Because I don’t have cable, my TV only gets about a dozen channels and that’s including several low budget public-access stations. But as luck would have it, there is one cable channel I do get: the Food Network, and although I’m sure it goes without saying, I watch it constantly. One of my friends always jokes that all my stories start with, “So I was watching the Food Network last night…” and really it’s kind of true. One of my favorite shows is “Best Thing I Ever Ate,” a program where Food Network personalities and foodie celebs talk about their favorite eats all over the country. I love watching because I can always count on someone to mention something in New York, and if it sounds good, which it usually does (these people, after all, are basically professional eaters) I can go find it myself. 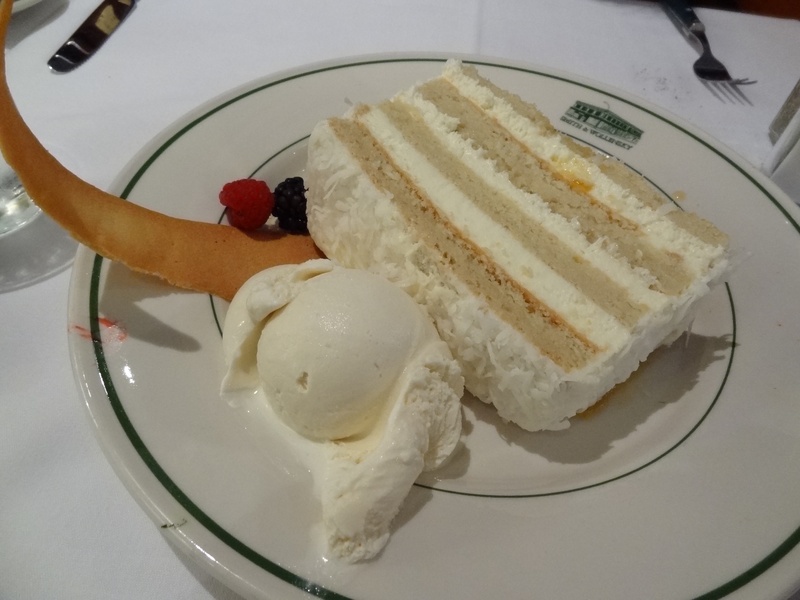 That’s what happened a few weeks ago when Chef Anne Burrell gushed about how even though she lives in the village, she will happily make the trek to midtown (a no-man’s land of office buildings and chain restaurants) for the coconut layer cake at famed steakhouse Smith & Wollensky. So last week, during Flaneur’s last week in the city before a summer in Italy, we too went to midtown in search of the cake that Chef Anne had gone on and on about. The massive slice, big enough for both of us to eat until we were physically uncomfortable, was made of four thin layers of incredibly moist, coconutty sweet cake alternating with layers of thick, creamy, almost mousse-like vanilla frosting and a top coat of shaved coconut. And because cake is always made better with ice cream, this one had a fat scoop of creamy, rich vanilla ice cream and a delicate, crisp cookie to go with it. I have no idea how someone might be able to squeeze this into their body after eating a steak but I definitely get why someone would travel across town and out of their way to have this delicious dessert, even if (and especially if) there wasn’t a steak before it. I’m with Chef Anne. I hate midtown but I’ll go back that way for this cake. Thanks Food Network. You’re all the cable I need. This entry was posted in Sweet stuff and tagged Anne Burrell, coconut cake, Food Network, ice cream, layer cake, Smith & Wollensky. Bookmark the permalink.